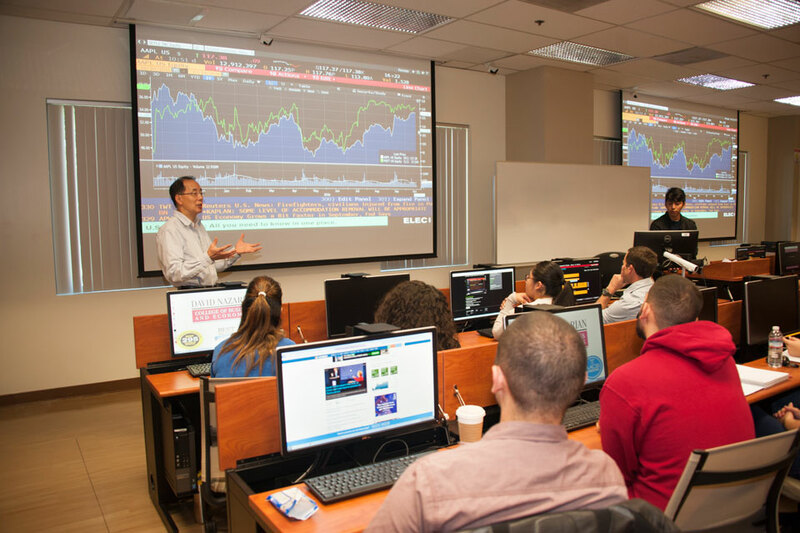 Finance professor Zhong-Gou Zhou teaches his investments course in the remodeled financial lab in Juniper Hall. Photo by Luis Garcia. 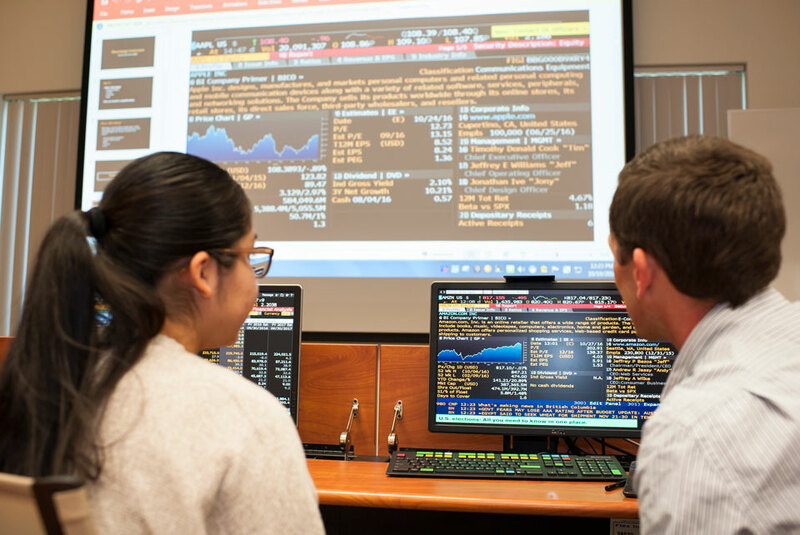 CSUN students have the opportunity to earn a Bloomberg Market Concept certification, using the Bloomberg Terminals in the financial lab. Photo by Luis Garcia. Students use the Bloomberg Terminals, which feature specialized keyboards, in CSUN's remodeled financial lab. Photo by Luis Garcia. There’s a little slice of Wall Street running through Northridge this fall. They’re nearly 3,000 miles from the closing bell and the New York Stock Exchange, but students in the California State University, Northridge David Nazarian College of Business and Economics are flexing their finance muscles in a newly remodeled lab that boasts more technological tools and the opportunity to earn a certificate in financial analysis. The Nazarian College, rated one of the nation’s leading business colleges, built the Financial Lab in CSUN’s Juniper Hall in fall 2014 and used its state funds to remodel the lab this past summer — changing its layout, adding more seating and installing Bloomberg Terminals. The terminals, equipped with financial-analysis analysis platform, enable finance professionals to monitor and analyze real-time data from the financial market. The Bloomberg Terminals debuted on campus in the fall 2015 semester, and professors incorporated the tools into assignments and projects for classes such as Advanced Topics in Finance, Business Valuation, Seminar in Financial Theory and Policy, and MBA Portfolio Management. However, the space was cramped and dark. In January, the college started to train student lab assistants to assist their peers in becoming Bloomberg Market Concept certified. Many CSUN finance professors grant extra credit for passing the certification exam. 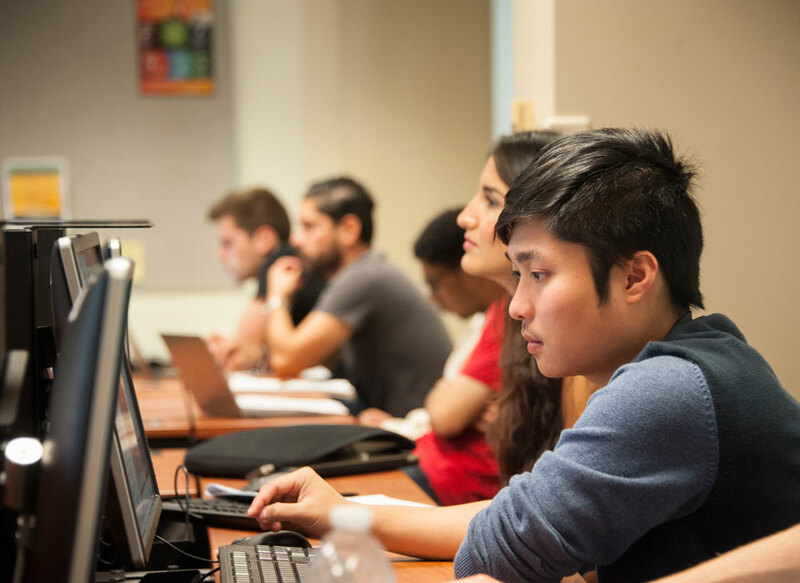 After an extensive remodel over the summer, the lab boasts eight specialized computers with specific keyboards, where CSUN students can work on their Bloomberg Market Concept certification for free. If students want to take the online workshop at home, CSUN provides discounted access for $149 per student. Jeron Norsworthy and Shanaya Pourgehghan, both seniors in finance, said they are grateful for the opportunity to earn the certification in before graduating. Funded by state funds, CSUN established a two-year contract with Bloomberg L.P. in August 2015 and installed the analytics platform in September 2015. The Richard Siegel Foundation, a nonprofit organization located in Murfreesboro, Tenn., that benefits educational institutions and related activities, donated $40,000 toward the total cost of the Bloomberg Terminals for 2015 and another $12,000 for this year’s costs. Hussein said she hopes to secure funding for another two-year contract and to continue investing in the training of lab assistants, who support students in their efforts to obtain the certification.